Lessons Learned from the #MSUrbanSTEM Build-a-Boat Quickfire Thank you UGS200H! 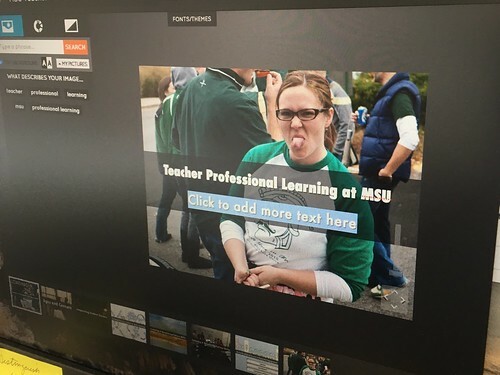 Erik stopped me this morning and said “hey, did you know there is a picture of you sticking your tongue out when you search for “MSU” on Haiku Deck.” No, no I did not know this. Sure enough, Haiku pulls from Creative Commons images on Flickr. I have been using Flickr for over 10 years and I’m a big supporter and contributor to the Creative Commons (it’s one of the main reasons I use Flickr for my social photo sharing!) I frequently tailgate, and, post pictures from MSU tailgates. Thus, a few years back I posted this picture (and a few others) of the fun, with the tags MSU, Tailgate, spartans, gogreen. Fast forward 7 years and Erik is searching for a nice picture of MSU for his presentation, and here I am, sticking my tongue out at him and who knows how many other Haiku/CC users. It’s not the worst thing that could happen in terms of a digital footprint, but, it did make me take another look at my Flickr tags. It also makes me think about Flickr’s auto-tagging feature and how they might influence my photo showing up on a CC search. Just spent some time going through my Flickr tags and cleaning things up a bit. Thanks Erik!